What are you going to do with a basic oversized boxy top pattern? You just add detail and make it your very own. That`s the little funny challenge Olu of Needle and Ted set us. All those bloggers are going to interpret the Ziggy Top in their own creative way. I can`t wait to see what everyone did! My girl doesn`t have that many trousers and because of that, nearly never wears t-shirts. I found a solution. Let my introduce you to….. the Ziggy Dress. I extended the hem to dress length and attached a draw-cord to give it a bit of shape around the waist. She felt in love with it from the first moment. It must be really cozy. This jersey, i bought locally, is nice and soft but doesn`t have a lot of stretch. I attached a button placket in the shoulder seam, in order that her head is going to fit trough the neckhole. Painless slip on and off really makes all the difference, if she`ll like or hate a piece of clothing. I`ll need a dress like this for myself! Such a lazy style, seems perfect for Sundays. You`ll look well-dressed while wearing kind of jogging suit. 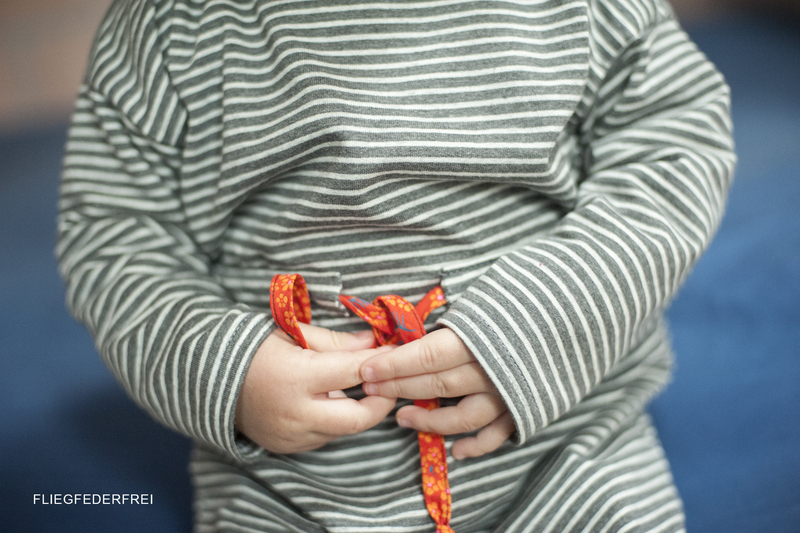 That`s it, a new comfy dress for my little bean and I can`t wait for the new Madeit Collection coming soon. 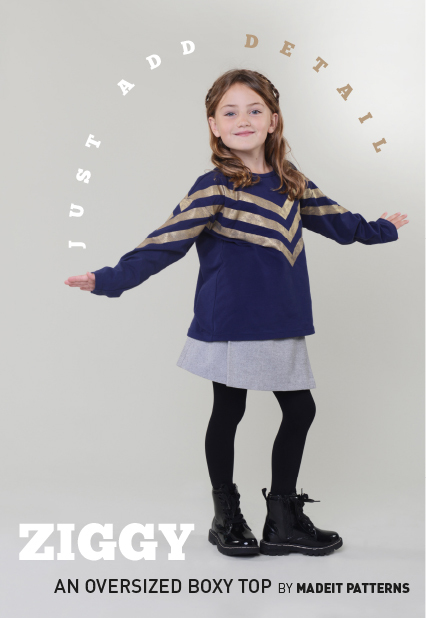 Psst… Madeit Patterns will be offering 20% off Ziggy from 23rd March – 29th March. 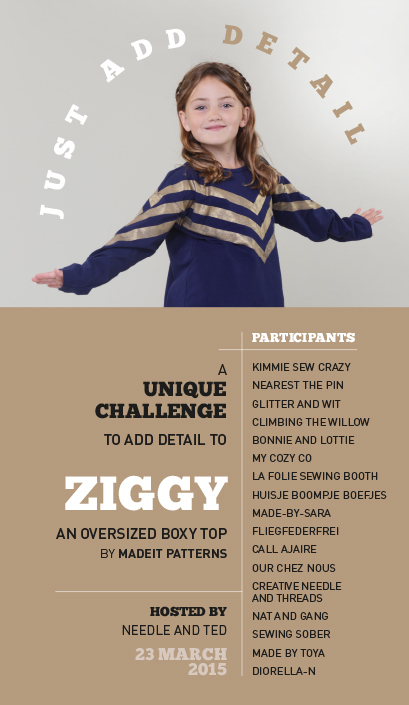 I`m off to check out the other Ziggy`s sewn by those talented bloggers. very sweet. and yay for comfy clothes!!! Lovely dress, the wiast string is a very smart idea, personally I prefer slim cut patterns over boxy ones, you made this one work very well. She is so cute! The floral tie is the perfect contrast color to the dress too. It looks so cozy yet stylish. This is very simple and pretty, looks like it would be a dress from a trendy expensive store : ). I am for sure making one like this for my little one! oh thank you for your nice words. it’s a very simple dress. I love it as a dress! This is definitely going to be one of my next projects! 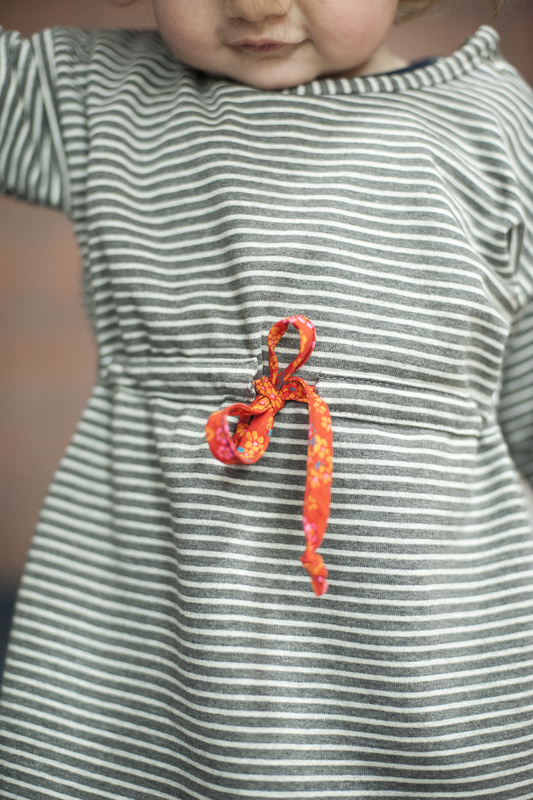 I thought about doing a drawstring waist like this, and now I wish I had! hey toya, i love your dinos! So cute to make it a dress! I love the waist it looks so sweet and clean. Very cute! great Idea to make the top a little dress. Wow! O love everything about your modified Ziggy! This was such a great idea! Love the knit and the floral & colorful detail.